Today's increasingly demanding applications, such as Ultra-HD TV, wireless display, and high quality video capture are driving the need for new video encoding and decoding technologies. With the increasing availability of OLED displays and 10 bit monitors, which offer a wider color range, consumers are demanding higher color fidelity than ever before. Plus, with 'beyond real time' HD video handling, video encoders/decoders must provide enough performance for tomorrow's Ultra-HD 4Kx2K applications, such as display surfaces and mosaic screens. H.265, also known as High Efficiency Video Coding (HEVC) is a video transcoding standard recently approved and ratified by ITU-T. It is a direct successor to the highly popular H.264 standard. H.265 is set to be rapidly adopted and deployed by manufacturers and content providers, especially for mobile video distribution and 4K Ultra-HD TV broadcast. 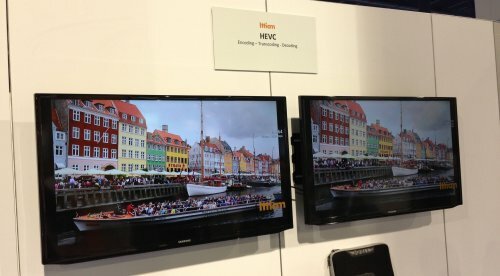 Several demonstrations of HEVC are in evidence across the industry. To date, we've predominantly seen software decode solutions for consumer electronics, running entirely on the CPU or using GPU compute to accelerate HEVC decode. Companies that have demonstrated software-based implementations include NTT Docomo, Telestream/MulticoreWare, Vanguard Video Solutions, and Ittiam. Fig. 1: Ittiam demonstrated software-based HEVC decoding at the NAB Show 2013. For the next generation of products, hardware-based HEVC decode and encode will be necessary to drive the requisite performance while keeping power consumption to a minimum. Multi-stream and 4K are key drivers for hardware HEVC decode and encode, which Imagination's IP has already been designed for. H.265 video coding is an order of magnitude more complex than previous codec implementations. HEVC divides a frame into small blocks (referred to as "CU" – or "coding units") and the prediction and transformation coding of the images is conducted within each CU. HEVC offers variable blocks that can handle up to 64×64 pixels, changing the size according to texture, while the previous generation H.264 standard relied on a macro-block size of a maximum of 16×16 pixels. Fig. 2: H.264 vs. H.265 (HEVC): larger block sizes enhance encoding efficiency*. This larger block size allows HEVC to achieve higher compression or higher resolution and improve parallel processing efficiency compared to H.264/MPEG-4 AVC. 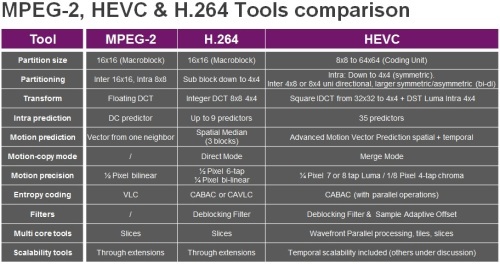 To get a better understanding of the differences between MPEG-2, H.264 and H.265/HEVC, you can find a comparison of the tools employed by each standard in Figure 3. Today, designing a video coding standard for both mobile and consumer devices is primarily aimed at achieving the highest coding efficiency possible. This translates into an ability to encode ordecode video at the lowest possible bitrate while maintaining a defined level of video quality. Several studies have compared the coding efficiency of the H.265 Main Profile (MP) to similar profiles from several existing video standards in use today, including H.264, MPEG-4 AVC, H.263, and H.262. These comparisons usually involve video encoding done for a range of application use-cases (live entertainment, video conferencing, films, etc.) and different bitrates corresponding to certain video test sequences. So far, HEVC has been shown to deliver superior bitrate reductions based on both objective (PSNR, SSIM, etc.) and subjective evaluations, making it ideal for delivering high quality video at low bitrates. Perhaps the key takeaway when thinking about H.265 is that simply using it for video compression does not guarantee quality. Indeed the quality of HEVC video is determined by how complex and feature-rich the encoder is. In fact, using a sub-optimal software-based solution or a low-quality HEVC encoder can lead to worse results than today’s best H.264 solutions. Encoder quality dependencies include the motion search algorithm and range, tool set implementation and rate control algorithm. One of the more interesting debates at the moment is around GPU compute-based HEVC software transcoding. These solutions are a reasonable first step towards implementing some relevant use cases for existing platforms that do not have dedicated hardware; HEVC at 1080p is one of a few examples. However, hardware video trans coding brings significant advantages and features (10-bit color, YCbCr 4:4:4 resolutions, etc.) so ultimately most platforms will include hardware video codecs. The combination of HEVC, 4K resolutions and the desire for higher frame rates means a core’s power consumption is critical. If not designed carefully, such a core might drive the overall system power consumption to extremes. Independent tests, for example, have shown that PowerVR video processors (VPUs) are not only lower power but much faster at transcoding video streams. A recent example from Anandtech, shown in Figure 3, compares a number of existing platforms encoding a standard video stream. Fig. 4: Imagination’s PowerVR video core enables Intel Clover Trail processor to deliver better performance, lower power and faster transcode. 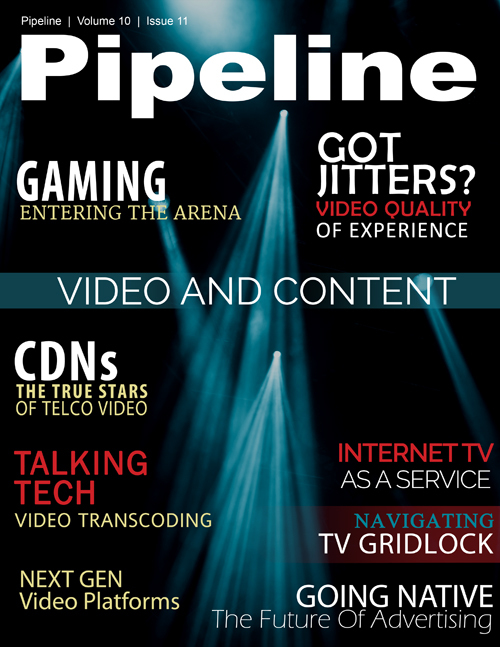 It is predicted that most OTT (over the top) services will transition to HEVC to deliver content to mobile phones while video conferencing companies will take advantage of the standard’s improved quality and lower bitrate to deliver better image resolutions. Interesting alternatives to H.265 are VP8 and VP9, the royalty-free codecs from Google. In 2010, Google launched an experimental version of YouTube that used the built-in multimedia capabilities of HTML5-based apps to stream videos. Consequently, the WebM Project was assembled and tasked with developing a new format for video and audio compression. Their work resulted in VP8, an open-source alternative to existing video standards. VP8 is a high-performance codec aimed at bringing high-quality video content and experiences to web-connected devices. Hardware support for VP8 enables real-time transcoding of high definition video, as well as real-time multi-stream transcoding between devices, allowing consumers to experience HD content anywhere on any device. More recently, Google released the royalty-free VP9 format, aiming to reduce the bitrate by half compared to VP8 while having the same video quality. For many mobile devices, initial support for VP9 will largely be based on software solutions before specialized video hardware will become available. The recently announced standard for 4K (and, believe it or not, 8K) TV called ITU-R BT.2020 makes recommendations for a wider selection of colors and increased bit- depth, which will result in noticeably better pictures on TV. 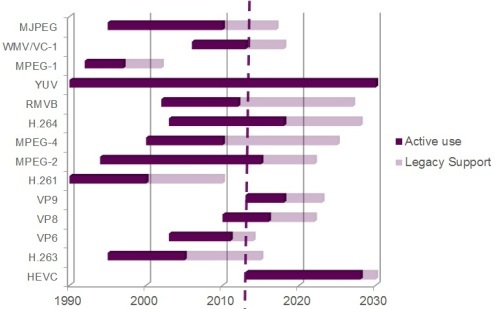 Although BT.2020 is still under development, the advantages it offers will drive a fast, widespread adoption of 10-bit colors in the 4K TV and HEVC space. 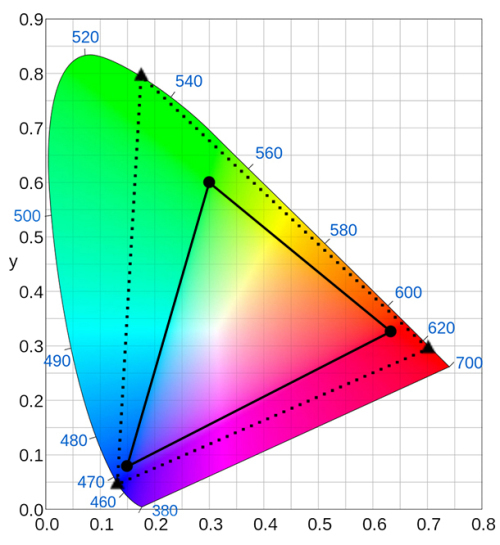 According to ITU-R BT.1361 and BT.2020 recommendations, H.265 (HEVC) transcoding at 4K resolutions mandates 10-bit color. These are specific coordinates for the locations of those colors as depicted by the smaller triangle on the chart in Figure 6. The color gamut described by these coordinates is reasonable, but certainly not as realistic as we experience in the real world; anything outside the triangle is not guaranteed to be captured by the camera, encoded on the disc, or accurately shown on your TV. These coordinates describe the larger triangle on the chart; this extends the range of colors to be captured and rendered on display devices. The second aspect about how BT.2020 defines color is bit depth. The number of bits used to represent each color determines the range of shades one can generate. Current systems use 8 bits per color, resulting in 28=256 different shades for each primary color (red, green and blue, respectively). The current Rec. 709 standard can support a total of 16.78 million colors (256 R x 256 G x 256 B). BT.2020 expands this range significantly by defining a minimum 10-bit color depth. By adding another two bits to each color representation, the number of overall possibilities increases to 1.07 billion (210=1024 x 1024 x 1024). This extended range has numerous advantages when representing a greater dynamic range between the lightest and darkest areas of a frame. Why do we need multi-standard video transcoders? For all the benefits offered by HEVC and VP9, the older standards cannot be abandoned. Vast amounts of digital content, professionally and consumer produced, will continue to exist for as long as the public plans to hold on to their DVD and Blu- ray collections! This means that multi-standard decode will always be a requirement. While 4K is available today only in some high-end implementations, this technology is coming soon to mainstream TVs. More and more 4K products will begin to enter the market as the content becomes available – driven by next-generation cameras with 4K capture capability, as well as new and traditional broadcast mechanisms. Imagination’s customers are already starting to build support for HEVC into their silicon with our complete video IP cores featuring 10-bit color depth support. With these technologies, tomorrow’s Ultra-HD products will provide amazing color and clarity for a brilliant consumer experience.